The Cannes Film Festival is the best film festival in the world. It is where every director dreams of premiering his or her film one day. It is also the place where movie deals are made on a daily basis, and the place to be to sell your film or pitch your next project. What I love most about this festival is that they have the utmost respect for filmmakers. If the Oscars are all about the actors, Cannes is all about the directors. I love how you can start a conversation with a stranger as you queue to watch a movie, and discuss films and filmmaking. You can also find yourself next to a legend like Wim Wenders, as happened to me this year while I was going into a screening. Many of the films that are shown in the Cannes competition and parallel sections are difficult and challenging to watch. This is a festival that encourages artistic freedom and there is always that one movie that will blow everyone away. It will make you realize just how much you love cinema, and that cinema matters because it can make you experience the most beautiful sensations; encouragement, empowerment and beauty. This year for me, that film was a Russian masterpiece entitled "Leviathan" by Andrey Zvyagintsev. The film is an artistic behemoth. I remember being a bit reluctant to go to the screening as the film is over 150 minutes long and it was a beautiful day outside, but minutes after it started, I was transported to the north of Russia and the world of that movie. The only side to Cannes I dislike is the people who cannot be bothered to watch the actual films. I'm always suspicious of them. They are either the braggers or the socialites. I usually end up establishing contact with many cinephiles, whom you can meet at the screenings, while waiting in line, maybe ordering a coffee at the bar inside the Palais or by sitting next to them while watching the films. I've made many long-lasting friendships over the years with people whom I've connected with over a film. The festival is also an extremely glamorous affair. The French invented "etiquette" and if you are invited to one of the red carpet competition premières in the evening, it is mandatory for men to wear a tuxedo and for ladies to wear a formal dress. I've seen festival officials turn away people who didn't stick to the rules, including men who thought a tie would do rather than a bow tie. Unfortunately, unless you are a well-known star, you won't make it past the barrier, invitation or not. This year I set up a few meetings with festival programmers and since I'm putting my next feature film together, I took the opportunity to pitch the script to several producers and sales agents, and to enjoy the glamorous side of Cannes. 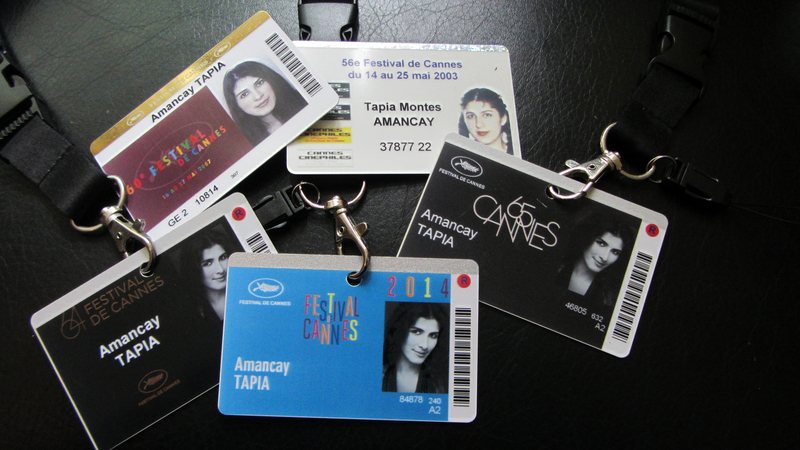 Unlike most film festivals, Cannes is an event reserved for film industry professionals and the press so you need to have an accreditation , without it, you literally cannot get anywhere. Entry to screenings, invite to the premieres or admission to official venues is strictly controlled and public access to the festival is non-existent. No accreditation, No access. Here are mine since my film student days still in pigtails! During the festival, Cannes is also all about the wonderful parties and the afore-mentioned evening premières but in order to attend one, you need to be invited. I was delighted to attend the première of the French film "L'homme Qu'on Aimait Trop" starring one of my screen idols, Catherine Deneuve, who graced the red carpet with her effortless beauty. 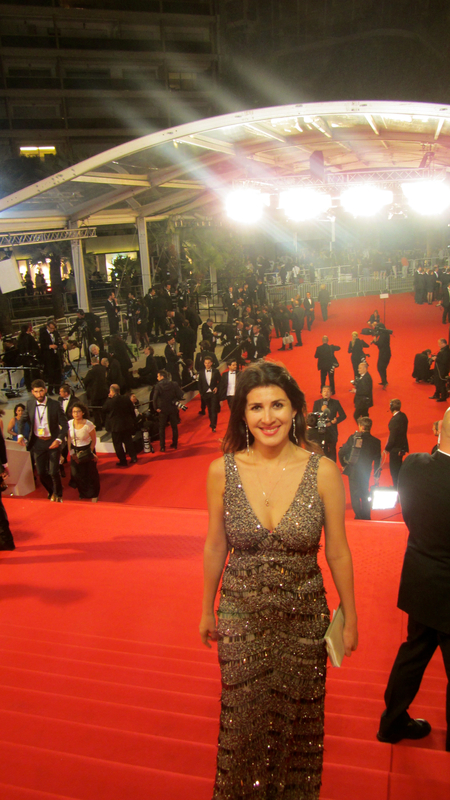 My days in Cannes were packed with screenings and meetings, and I only had 30 minutes to get ready before my car arrived on the evening that I attended this première. I got dressed in a room in the beautiful Majestic Barrière hotel and for a few hours, I felt like a star. I walked along the red carpet all the way to the top of the steps feeling like a fairytale princess. Once I took my seat in The Grand Théâtre Lumière, I experienced my favorite cinematic moment, watching the Cannes film festival trailer. They screen it before every film at the festival. This trailer shows the red carpet steps that lead all the way to the stars. The savvy audience loves this too, as they clap ferociously every time they see it. After the screening, it was time to celebrate; I was invited to a yacht party where the host stated that there were to be "strictly no photos". But even though I have no visual mementos, I have the experience of being at an unforgettable party that reminded me of Fellini's "8 ½" or "La Dolce Vita". Life is beautiful sometimes. I'm now back to my indie filmmaker reality of rewriting scripts and 5 am wake-up calls, but the fairytale I lived while in Cannes, still makes me smile. I can close my eyes, and let my memory take me back to the moments of beauty, elegance and glamour that I dreamed of as a little girl. Cannes, je t'aime!